This. is… LEGIT. Check out the Full Ted Talk featured on Beyonce’s “Flawless” entitled “We should all be feminists.” by Chimamanda Ngozi Adichie. Remember to share your thoughts/comments below! What was your favorite Beyonce moment? So, Queen B had quite a few captivating moments throughout her visual album. Like that time she started twerking her whole body. Or that time she fell from the air onto the bed… Yeah, no big deal. We do that all the time. Talk about “Flawless.” Share your favorite Beyonce moment and comment below! 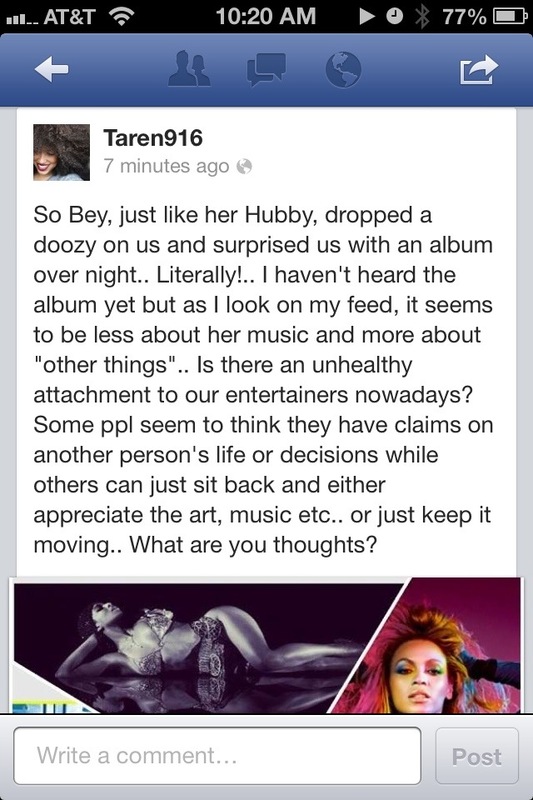 Taren guy has a really good point here. Since when does appreciation for music and artists become worship, or idolatry?